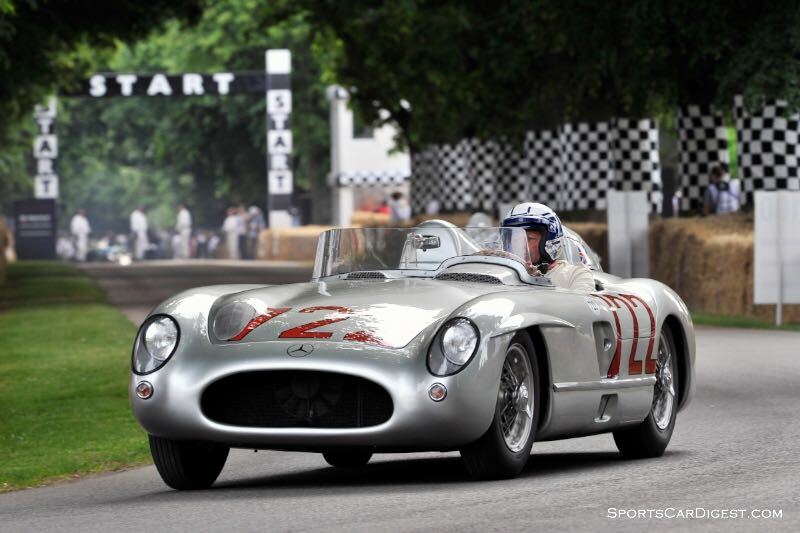 The 2015 Goodwood Festival of Speed celebrated the most successful racing sports car of the 1955 motor sport season, the Mercedes-Benz 300 SLR. 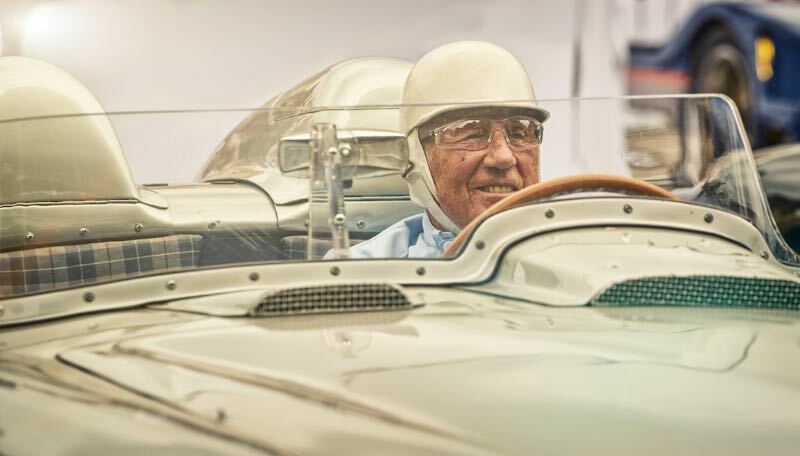 Sixty years after the Mille Miglia victory by Stirling Moss driving a 300 SLR, the world’s largest automotive garden party celebrated the British racing icon Moss and his team colleague Hans Herrmann in their authentic silver racing sports cars from 25 to 28 June. Only nine of the 300 SLR racing sports car with which Mercedes-Benz immediately won the 1955 world sports car championship were built. Eight of these 300 SLRs have survived, six of them in the care of the Mercedes-Benz Classic vehicle collection and marked by different biographies. Apart from the successful open racing sports cars of 1955 with chassis numbers 1 to 6, the family of cars in the W 196 S series includes two coupes intended for long-distance competition, though they never actually raced. These are chassis numbers 7 and 8. The car with chassis number 10 had modified technical features with a view to the 1956 season. The latest research shows that there was never a car with chassis number 9. 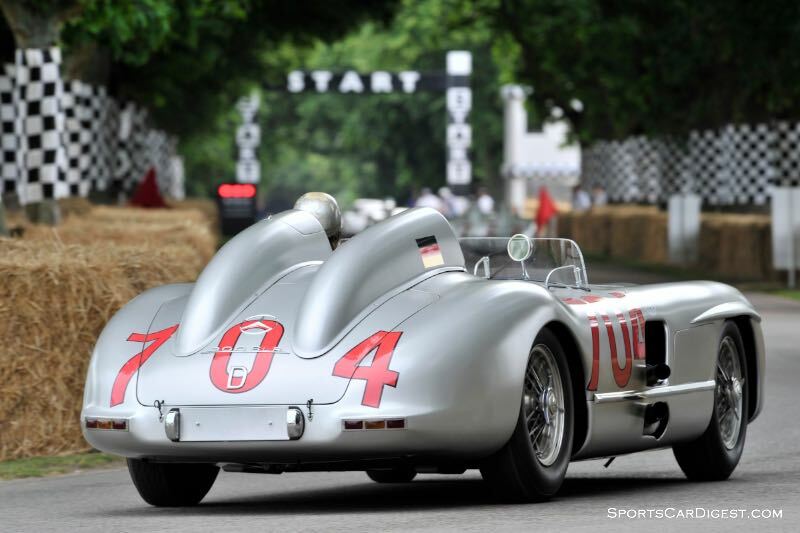 At the 2015 Goodwood FoS, Mercedes-Benz Classic presented the cars with chassis numbers 1, 2, 4, 5 (the last on loan from Cite de l’Automobile, Collection Schlumpf in France), 7, 8 and 10. Accordingly the 2015 Festival of Speed provided a comprehensive insight into the different development stages of the W 196 S in the ambiance of past motor racing eras. As a special highlight, Sir Stirling Moss was reunited with the 300 SLR bearing chassis number 4. It was in this car that Moss won the 1955 Mille Miglia – the 300 SLR’s first race outing – in the best time ever achieved for the 1000-mile race. To commemorate this victory, the car in Goodwood wore the legendary start number 722 with which Moss and his co-driver Denis Jenkinson took to the starting ramp for the Mille Miglia at 7.22 a.m. on 1 May 1955. 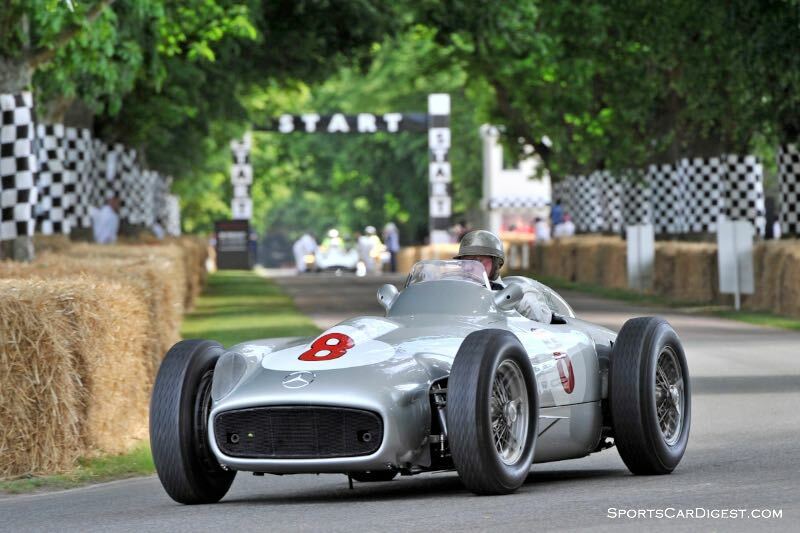 Stirling Moss and Hans Herrmann were two of the drivers who contributed greatly to the outstanding success of Mercedes-Benz in the 1955 motor racing season. 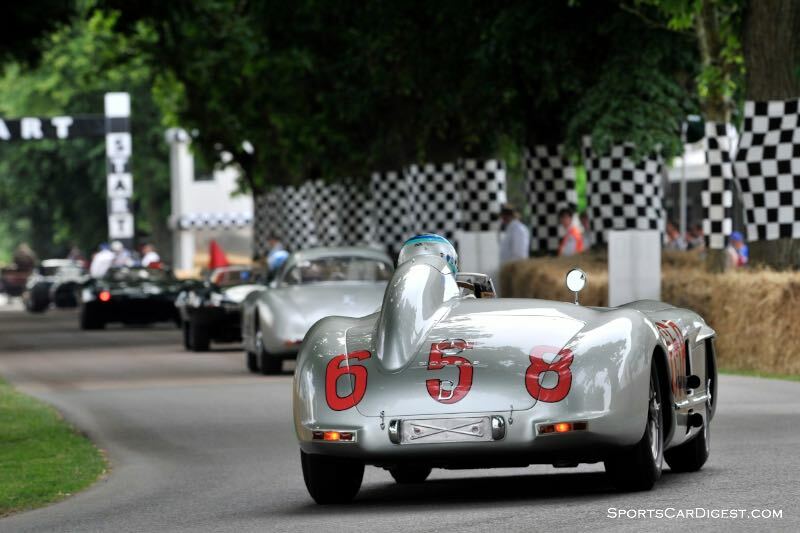 The reunion of these two veterans with the seven 300 SLRs at the 2015 Goodwood Festival of Speed amounted to an authentic journey through time. Visitors experienced at first hand how perfect interaction between man and machine still worked its magic 60 years on: after more than six decades, both Sir Stirling Moss and Hans Herrmann took to the wheel of their 1955 racing sports cars and drove them on the hillclimb circuit. With his victories in the Mille Miglia, the International Tourist Trophy (with John Cooper Fitch) and the Targa Florio (with Peter Collins), Sir Stirling Moss in particular stands for the race history of the 300 SLR. But in 1955 Hans Herrmann too was a hot favourite for victory in the Mille Miglia, until he was forced to retire by an unfortunate defect when in second place. 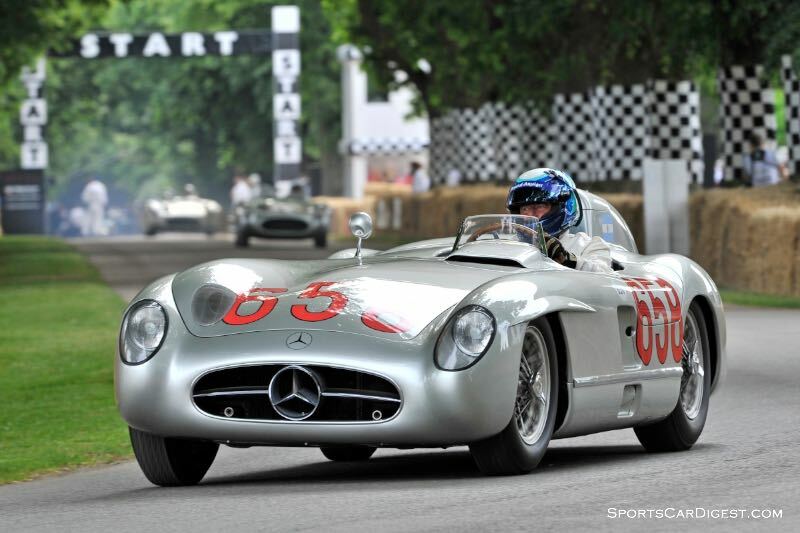 In addition to Sir Stirling Moss and Hans Herrmann, other Mercedes-Benz Brand Ambassadors such as Klaus Ludwig, Jochen Mass, Sir Jackie Stewart and Susie Wolff were guests at the 2015 Festival of Speed. The 22nd Festival of Speed was held from 25 to 28 June 2015 on the estate of the Earl of March and Kinrara in Goodwood, West Sussex, England. 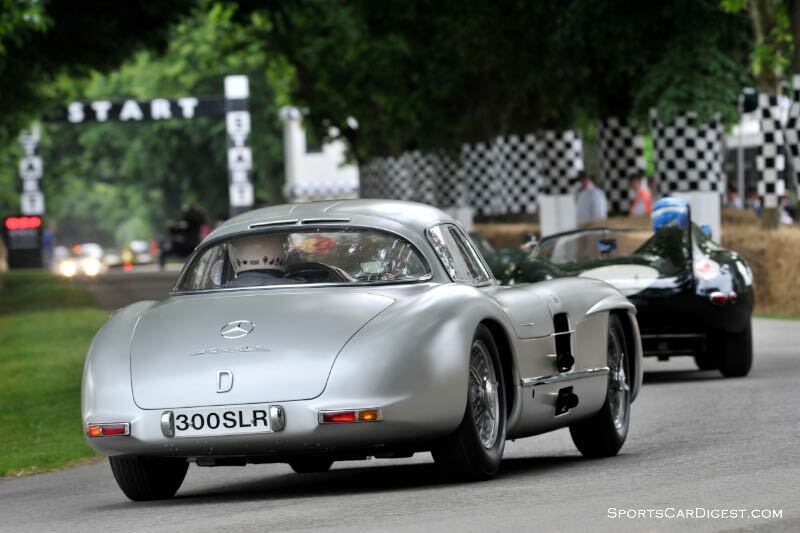 In 1955, Mercedes-Benz won the world sports car championship with the 300 SLR (W 196 S). In principle, the car was a model W 196 R Formula 1 racing car fitted with a two-seater sports car body. The main technical difference was in the engine: the racing sports car, which was not bound by the Formula 1 rule, was powered by a three-litre version of the in-line eight-cylinder engine and had cylinder blocks made of light alloy rather than steel. 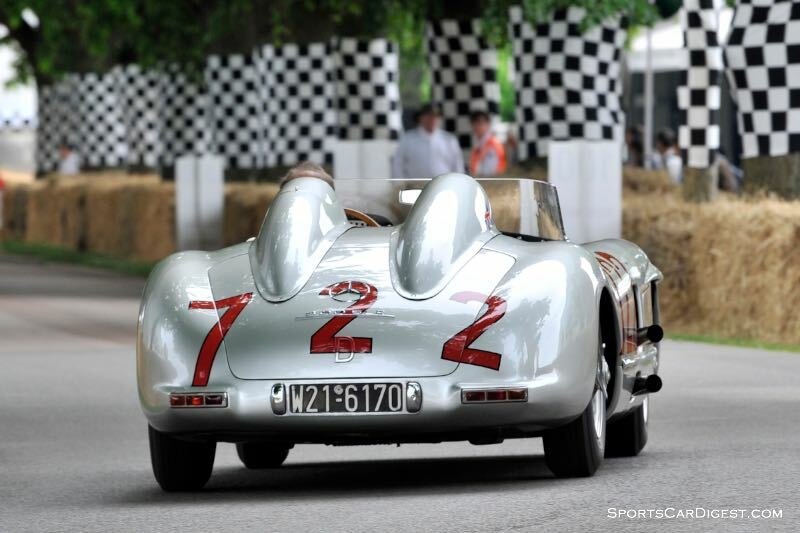 In addition, the 300 SLR did not run on special methanol-based racing fuel, but rather on regular 4-star petrol. An output of 222 kW (302 hp) plus great robustness and reliability made the 300 SLR far superior to its competitors in 1955, as it demonstrated with double victories in the Mille Miglia, the Eifel Race, the Swedish Grand Prix and the Targa Florio. In the 1955 Mille Miglia, Stirling Moss and co-driver Denis Jenkinson (start number 722) won with a still unsurpassed average speed of 157.65 km/h. The results achieved by this sports racing car are unparalleled even today: the W 196 S won every race started and finished by a Mercedes-Benz 300 SLR. 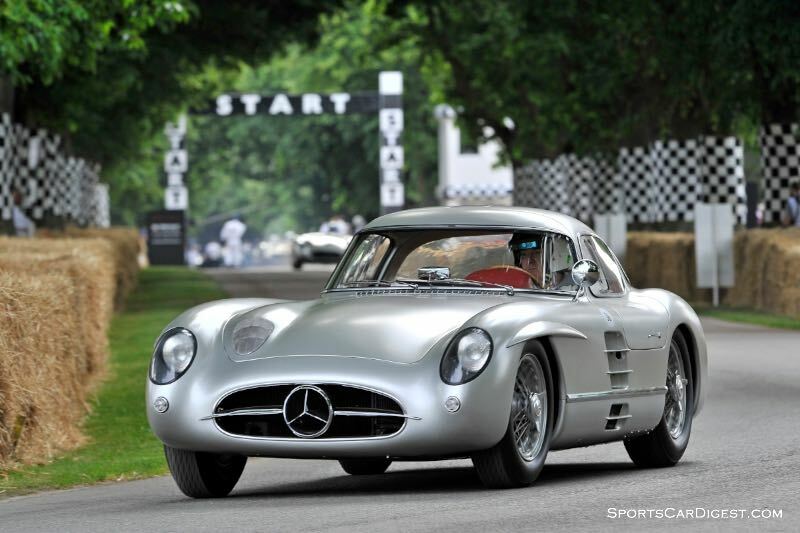 Mercedes-Benz had planned to build the 300 SLR racing sports car for the 1955 racing season only as a coupe. Instead the drivers opted for a roadster, above all in view of the expected noise level in the cockpit. Nonetheless two coupes were built in 1955 under the aegis of Rudolf Uhlenhaut, with a design close to that of the 300 SL sports cars. Their intended use for long-distance races in the 1956 season, beginning with the Carrera Panamericana scheduled for November 1955, suggested that a closed vehicle would be more comfortable and therefore suitable. However, the long-distance race in Central America was not approved by the Mexican government, and was not held in 1955. The coupes were therefore only used for practice runs – for example in Sweden, Northern Ireland and Sicily. Later one of the two coupes was registered for use on the roads as a test and business car for Rudolf Uhlenhaut. Dubbed the “Uhlenhaut Coupe”, this car capable of up to 290 km/h became the absolute dream car of the 1950s. It was just as famous as the two-seater 300 SLRs used on the racetrack. The #722 (first page of photos, 7th photo) has an Austrian license plate (‘number plate’) from the city of Vienna (“W”). Wonder why.